In April 2013, PTCL had upgraded its all 1Mbps student package to 2Mbps package for almost two months at cost of 1Mbps. Now the promotion time is over and PTCL is reminding its users to revert their DSL broadband packages back to 1Mbps otherwise they will be charger at price of 2Mbps Student Package from 1st of July and onward. PTCL is reminding its users via phone calls and in-browser messages. Following is the message which appears on users browsers while browsing the internet. 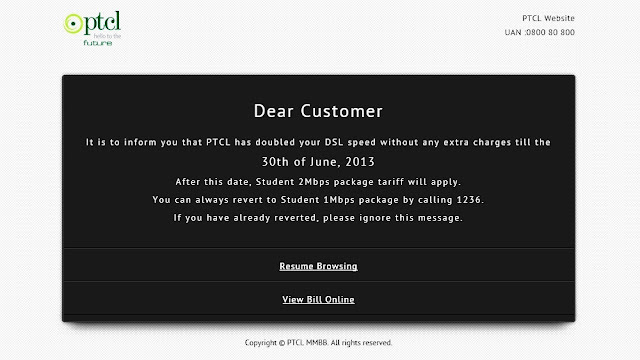 It is to inform you that PTCL has doubled your DSL speed without any extra charges till the 30th of June, 2013. After this date, Student 2Mbps package tariff will apply. You can always revert to Student 1Mbps package by calling 1236. If you have already reverted, please ignore this message. Following is the screen short of the in-browser message which appeared while browsing. The cost of 2Mbps student package is 1,299 per month.